Prior to heading to Boston this summer, I checked out the famous children's book Make Way for Ducklings by Robert McCloskey* from our library. I was hoping it would be a simple way to introduce the city and some of the sites to The Arrow before arriving. 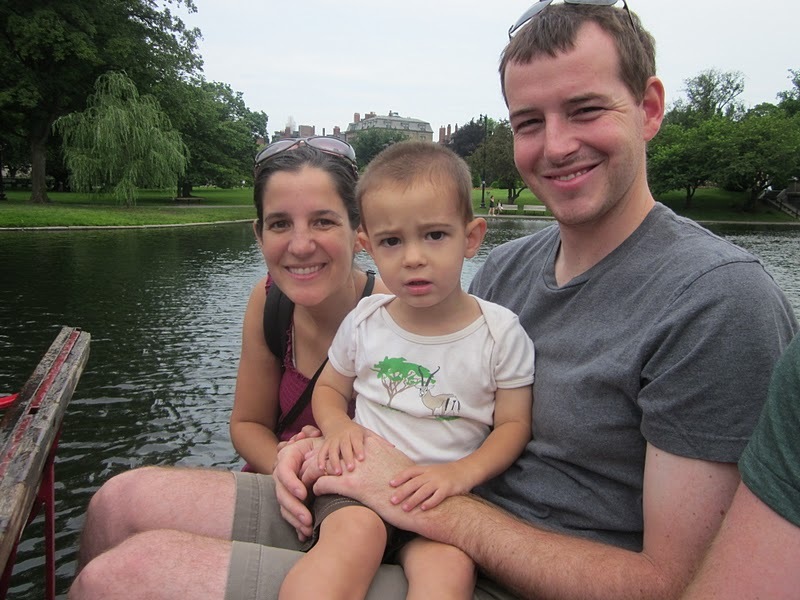 (If you're not familiar with the story, it's about a family of ducks who settle in the Boston Commons.) 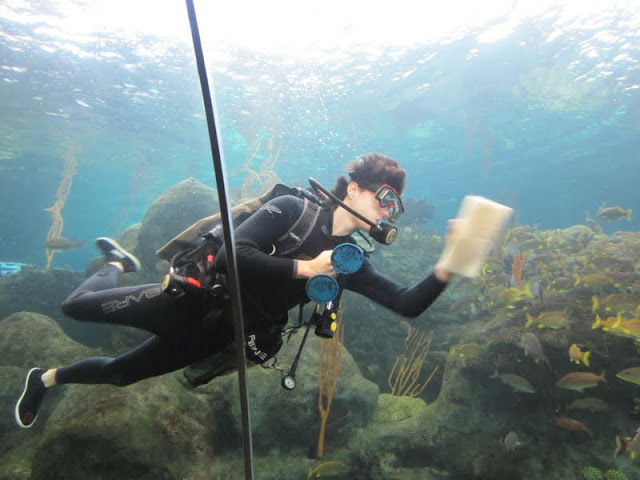 Alas, while he is a voracious reader, he never really took to the book and hardly glanced at it in the weeks preceding our trip. Not a total loss, though. I loved it and flipped through it several times before I returned it. 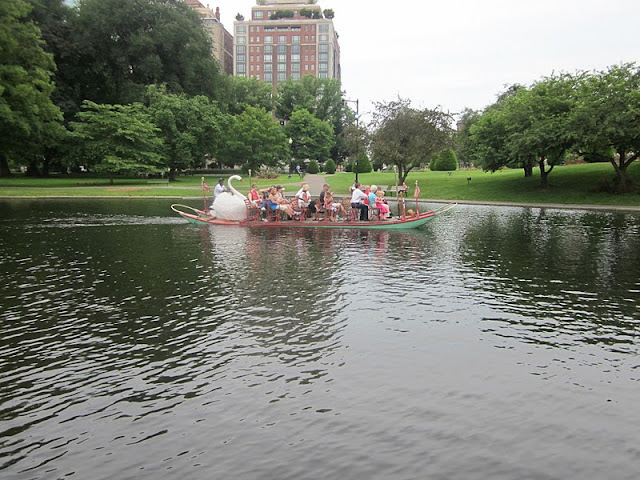 That book, in combination with several blog friends' recommendations, put a swan boat ride in the Boston Public Garden at the top of my list of things I wanted to do while visiting the city. So on our first morning there, we made that our first stop. We arrived right as it opened at 10 a.m. and only had to stand in line briefly. It gave us a chance to watch the first few boats depart. Insider Tip: If you find yourself waiting in a long line for the boats, I'd tag-team the parenting. Have someone wait in line until you get close to the boat house, while the other runs around in the park with the kids. The ride itself was a pleasurable 15 minutes or so. Just long enough to hold a toddler's attention without getting too wiggly. 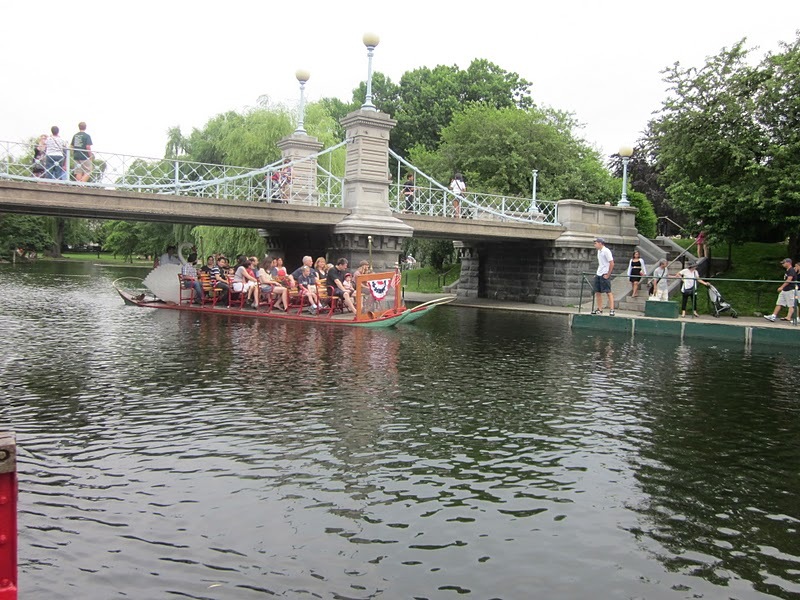 After taking a boat ride, you're only steps away from a carousel, playground and the Boston Common Frog Pond. We walked by these fun attractions, but they weren't open for the day yet. If you time your visit right, you could easily fill a morning or afternoon in this part of the city. The Boston Public Garden is bound by Arlington, Boylston, Charles and Beacon Streets. The Green Line Arlington Station is the closest T stop. $2.75 for adults, $1.50 for children 2-15. The 2011 season has concluded. 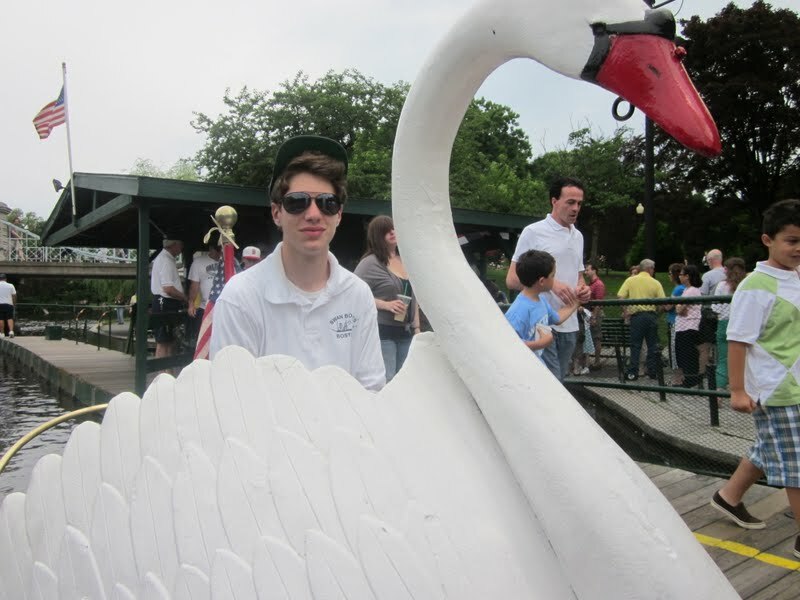 The swan boats will begin running again sometime in April of 2012.
Insider Tip: There's not really a good place to park a stroller. We had a cheap one with us, so we felt comfortable just folding it up and parking it near a bench while we rode the boat. If you're traveling with an expensive stroller, consider bringing a lock of some sort to protect it from theft. Like what you see? Then "like" Arrows Sent Forth on Facebook! You might also enjoy my Boston Trip Report, chronicling our 5 days in the city. *Links to my Amazon Affiliate account. A small portion of any sales made through these links will come back to support this blog, but this does not in any way increase the cost of purchase for you. One of my favorite memories from last year was taking The Arrow to the Yo Gabba Gabba Live show. I know not everyone allows their kids to watch television (and I say bravo to anyone who manages to avoid it!). But taking The Arrow to a fancy theatre to see his favorite characters come to life was a really unique experience for him that I certainly won't forget. 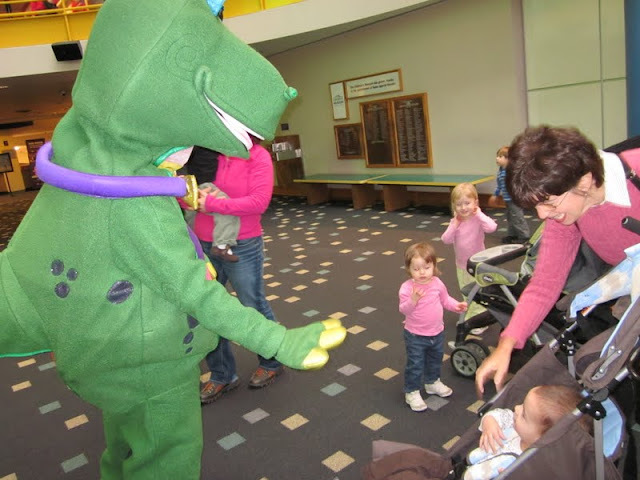 It can be hard to find age appropriate cultural experiences like this for toddlers and preschoolers, and at least these traveling shows provide a mechanism to do that. The cost of these live shows can be prohibitive though, especially when you're pricing tickets for the whole family. So I'm excited to be giving away a family 4-pack of tickets to the upcoming Max and Ruby Live Show at the Murat Theatre in downtown Indianapolis. Deadline to enter is midnight on Sunday, October 2. On Monday, October 3, I will randomly draw one lucky winner. I will do my best to contact that winner (so make sure you provide some contact info!) You will have 24 hours to respond to me, and if I don't hear from you, then I will move on to another. So on and so forth. 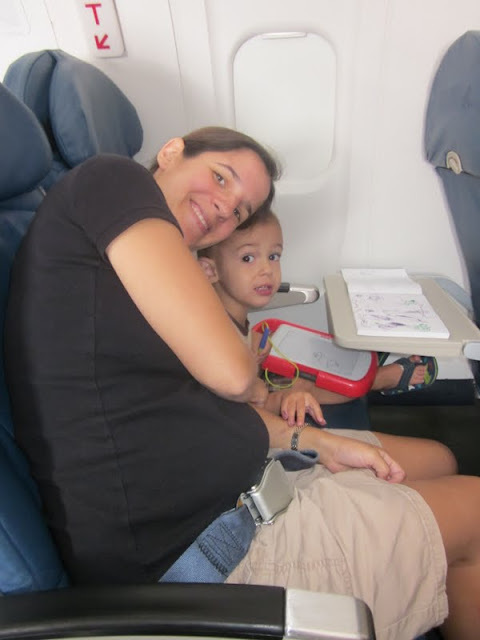 Please leave me a comment telling me your favorite kid-friendly outing. Share a link to this giveaway through a social media outlet of your choice, and leave me a comment to tell me you've done so. 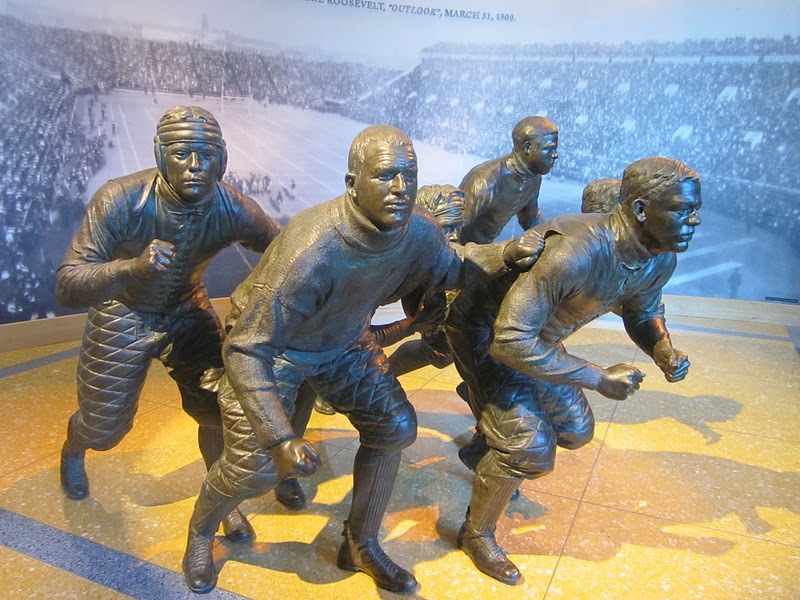 If you're visiting Arrows Sent Forth for the first time, and are from the Indianapolis-area, you may be interested in reading some of my family's Indiana Adventures. Perhaps it'll inspire your family to try a new destination and go on an Indiana adventure of your own! If so, I'd love to hear about it! 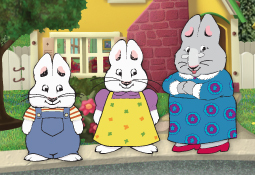 Disclosure: I received the family 4-pack of tickets to Max and Ruby Live free of charge from a local PR agency. I received no other compensation nor did I receive tickets to the show beyond this giveaway. This is just a way for me to thank you for reading and hopefully provide some fun family memories! I'm linking up to Things I Love Thursday at The Diaper Diaries. I'm typically not a fan of museum cafeterias. I usually find the food to be boring and overpriced. Plus, the atmosphere often reminds me of my own high school cafeteria. (Dark, windowless rooms with little decor and unnatural lighting... sound like your high school?) There's just something about stark tables and feeding people sandwiches en masse that takes away from what's otherwise a fun, cultural experience. So I'm happy to report that the Sky City Cafe at the Eiteljorg Museum in Indianapolis actually enhances a visit to the museum. 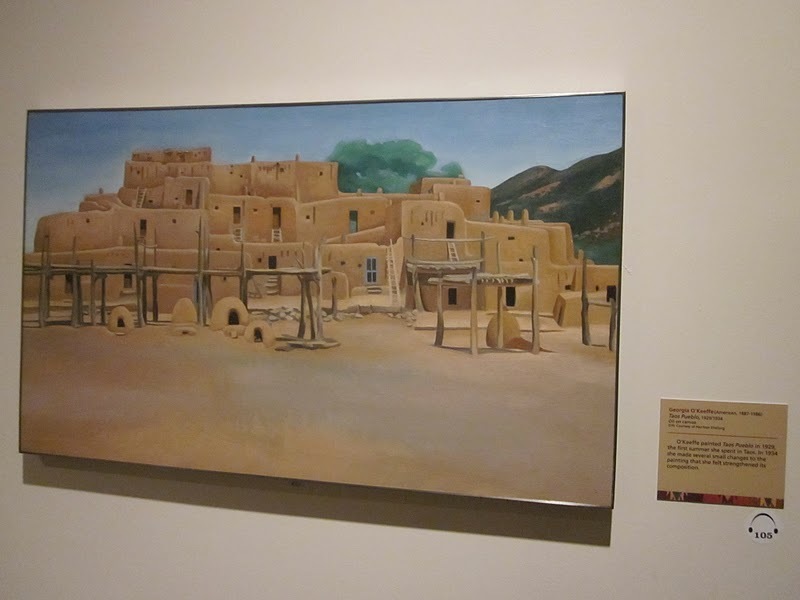 Nearly all the food is inspired by the American Southwest region or Native American heritage. For example, the fruit salad you see above is topped with a prickly pear dressing. It's just sweet enough to heighten the flavors of the ripe fruit. And my Mohave Valley sandwich is a portabello mushroom, typed with queso fresco, and other yummy veggies. In my pregnant stage, I don't usually order up a salad for lunch because it just isn't filling enough to keep me going all afternoon. 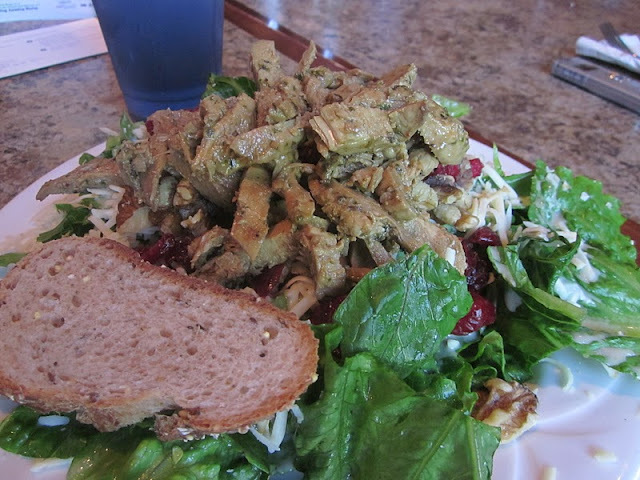 But I have to admit I was jealous of this Oregon Trail Salad ordered by the guest sitting next to me (who was kind enough to let me photograph his lunch before he dug in). The chipotle grilled chicken looked so moist and was piled so high I'm sure it would fill up even the hungriest of guests. A full menu is available here if you're mouth isn't already watering. There's also a kids menu that features some "safe" choices for the picky eaters, but also a few options with southwestern flair for those a little more adventurous. The atmosphere lives up to the delicious bites. On a nice day, my preference would be to sit outside on the terrace, which overlooks downtown Indy's beautiful Canal Walk. But the inside dining area is certainly an upgrade from the typical museum cafeteria, with warm colors and big windows that let in a lot of natural light. If you're not planning a visit to the Eiteljorg (which you should reconsider! ), you can dine at Sky City Cafe without paying admission to the museum. They'll also comp your parking. This makes the cafe a great choice for downtown workers looking for a little variety in their usual lunch options. It appeared many were rolling up their dress shirt sleeves and catching some sun while they dined when I visited in June. 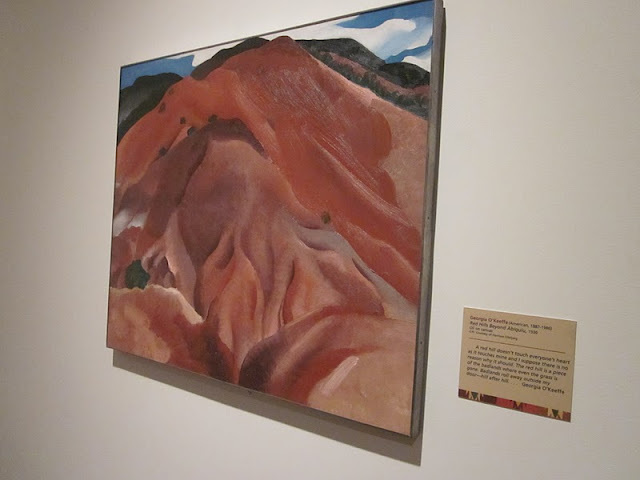 Earlier this week, I posted a daydream about my time at the Eiteljorg. Last week, I had a guest post at Midwest Guest about the more practical aspects of a visit to the Eiteljorg. 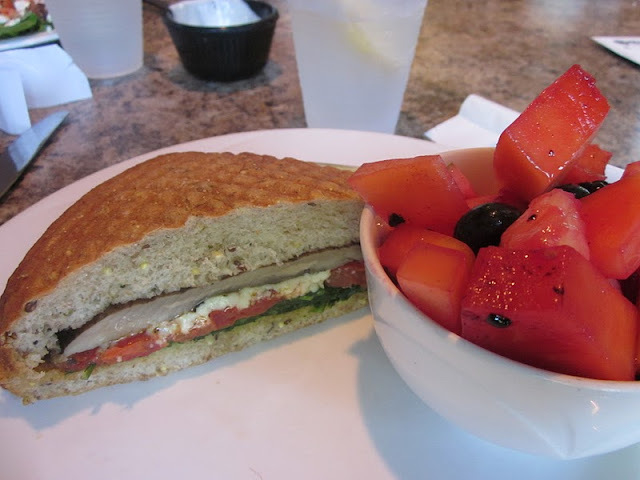 You might also enjoy my friend Amy's post about the Sky City Cafe, at her Food Flights blog. 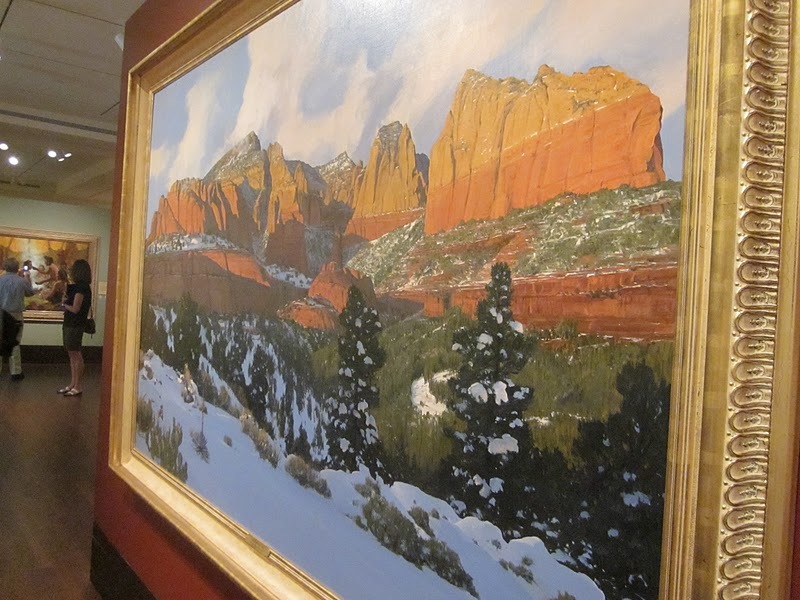 Disclosure: I was invited to tour the Eiteljorg Museum as part of a White River State Park press trip, which included my admission and lunch at Sky City Cafe. 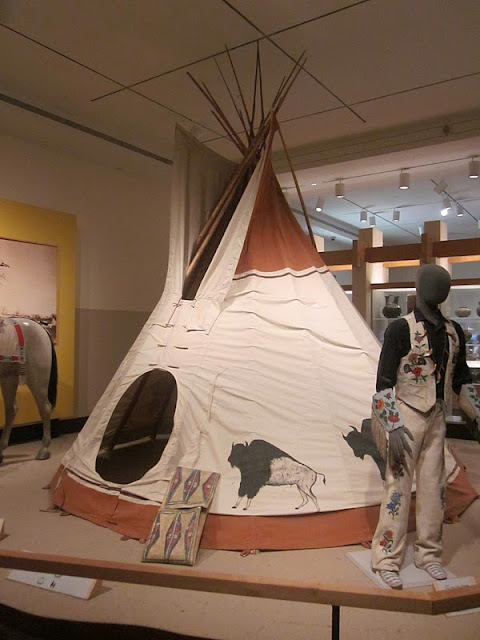 I was under no obligation to write about my time at the museum, and all opinions expressed are my own. Whew... it's been a busy summer! I'm still unpacking from our last trip but thought I better write a post about traveling while pregnant while it's all still fresh in my mind. Because if there's one symptom of pregnancy that I suffer from thoroughly, it's forgetfulness! 1.) Timing. 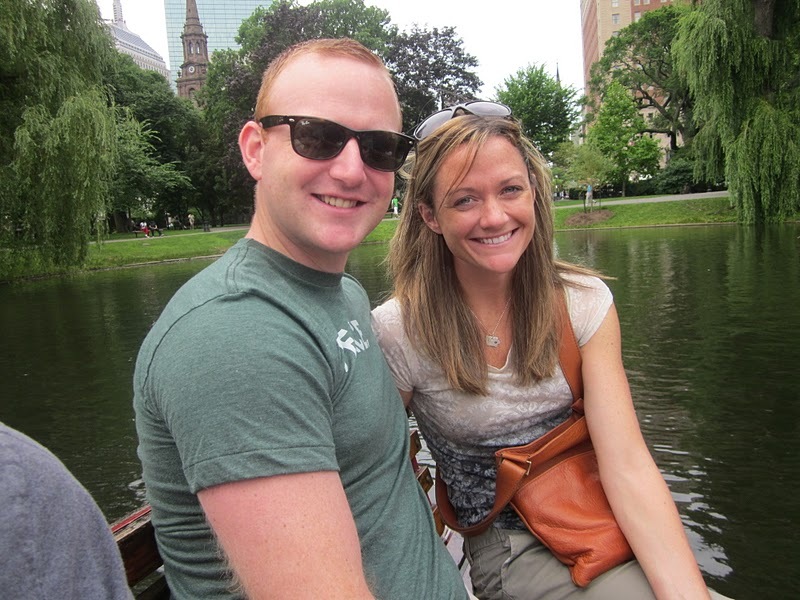 The bulk of our travels during this pregnancy have occurred during the blissful second trimester. When my energy was at its peak and sickness and discomfort were at a minimum. This means I haven't done a darn thing to get ready for Baby Arrow to arrive, but at least I have lots of fun memories! 2.) Snacks. I didn't experience this nearly as much with my first pregnancy, but this time around, I feel really lousy if I haven't had something to eat just about every two hours. Since that doesn't always correspond with a meal time, I have tried to plan accordingly by always carrying a small snack with me. A few of my favorites are Clif Bar Energy Bars,* Emerald Breakfast On The Go snack packs,* or just some crackers, an apple or banana. I even keep a few granola bars in my car for unexpected hunger attacks or traffic delays. 4.) Daily rest time. Fortunately (for so many reasons), The Arrow still takes an afternoon nap, even when we travel. While in the past, we've been content to let him do that in the car or stroller, during our travels this summer we made it a point to head back to our rental home or hotel so that I could have some R and R also. This really helped me to enjoy the evenings instead of feeling like I might collapse. 5.) Be active at home, too. I've been trying to either walk or bike daily when we're at home, in addition to my normal caring-for-a-2-year-old activity. It has helped me to keep up with my family on our adventures when we're away from home without my body going into total shock. I've been a lot more active this pregnancy than I was during my first, and I feel so much better for it. If the weather doesn't allow you to get out, then perhaps you can do a pregnancy workout from home. I recommend Prenatal Yoga by Shiva Rea* as a good, relaxing yet strength-building workout. 7.) Build in a day of rest. It's not always possible, but we've tried to return home a day prior to my husband going back to work. This gives me a chance to rest when we get back, which I have found I really need. When my husband has returned to work the day after we get home, then I try to make sure The Arrow and I don't have much planned so that we can just chill out and rest. I find he needs this too, and we're all happier for it. 8.) Flip flops. This is not normally the footwear I recommend for traveling, especially if you're doing a lot of walking. But my feet tend to expand, swell, and just change rapidly throughout the day when it's hot, and quality flip flops have allowed that to happen in relative comfort. I really like the Teva Women's Olawahu* style. 9.) Invest in a few maternity dresses. Nothing fancy, I'm talking about cotton, summery sundresses (if you're traveling in the summer). I own a few, and they were great to take on trips. They took up less room in the suitcase and were much cooler because it was only one layer to deal with, instead of maternity top, shorts, camisole, etc. 10.) Baby Powder. I don't leave home without my Johnson's Baby Powder* (preferably in a travel size). I don't normally sweat much, but I do when I'm pregnant. My sister suggested baby powder and by applying it each morning in trouble spots before we head out to sightsee, hike, or whatever we have planned, I'm much more comfortable throughout the day. My apologies if this is a bit TMI. Speaking of TMI, who has a suggestion for avoiding restroom breaks every 45 minutes on road trips? I became quite familiar with far too many exits on I-74 between Indiana and Iowa this weekend. In honor of the Labor Day holiday weekend, I thought I'd share some fun and interesting photos from unique jobs we've spotted while traveling. Can you imagine cleaning this tank at the Florida Aquarium in Tampa? During our trip to Boston, this young man maneuvered our Swan Boat around the pond by pedaling. He claimed it's only a little harder than riding a bike, but with about 20 people on the boat, I'm not so sure I believe him. 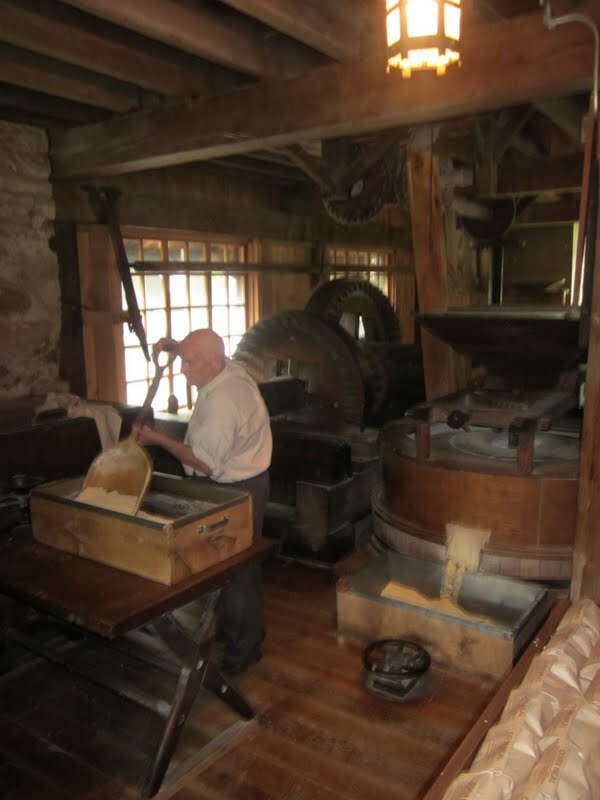 And this grist mill operator at Spring Mill State Park knew so much about the fascinating history of the mill. I can't imagine giving a 20 minute speech while operating a 100+ year-old piece of equipment. While my family is all play and no work during our travels, we sure do appreciate all the hard working folks who make our trips so much fun! Happy Labor Day!